We always need volunteers to help in any of the KidZone rooms! You will be asked to hold a baby, play with a toddler, or assist teachers as they present the lesson. Our desire is to love on these kids every Sunday morning, and we would love for you to jump in and help as we seek to do that! The set up/tear down team is responsible for just that, setting up and tearing down church each Sunday. We’re looking for servant hearts to help set up tables, chairs, and KidZone classrooms. The coffee team keeps Antioch fueled during our time of worship each Sunday! They brew coffee before services while also keeping our coffee cart stocked with supplies for coffee and tea lovers alike. They also tear down the coffee set up at the end of the day. The communion team is responsible for preparing the Lord’s Supper for all believers before service, as well as tearing it down and putting everything away at the end of the day. This team gives us the opportunity to participate in this sacred act of remembrance. The greeting team is responsible for making members and guests feel welcome at Antioch! With big smiles and warm personalities, they greet guests, hand out bulletins, and help answer questions. If you are a “people person” and loving making others feel welcome, we need you! 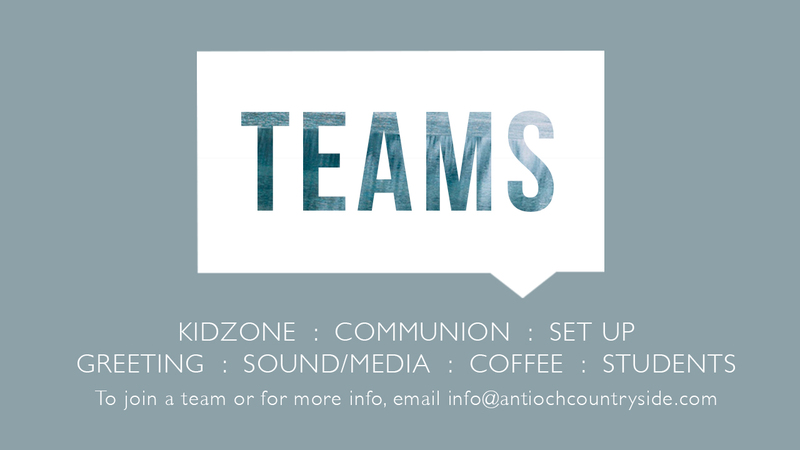 The connecting team does just that – they connect members, regular attendees and guests to groups, teams, and events at Antioch. Do you have a heart to see people get more connected? We would love for you to serve on our connecting team! Sound & Media Team is responsible for the worship and sermon slides and sound tech each Sunday morning. Right now there are great opportunities to be involved “behind-the-scenes.” There is a need for both set-up & tear-down, as well as the technical side of mixing sound. No previous tech experience is required, but it is welcomed. We provide all the training you need. The student ministry team works directly with Roots, Ignite, and Club 56 students. If you love serving and connecting with youth, we’d love to talk to you! For more information about any of these ministries or to sign up to volunteer, you can contact the ministry leader directly via email, you can fill out the form below, or you can contact info@antiochcountryside.com. If you have interest in serving in any of these areas, please fill out the form below and we will connect you with a serving team!